God loves Daddy and me, He listens when we pray, When we tell Him “Thank You,” it’s the best part of our day! Cuddle up cozy-close with an adorable reminder of God’s love for daddies and their little ones. 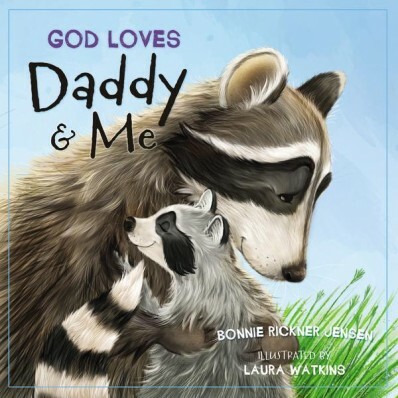 Celebrating loving fathers, precious children, and the God who loves them all, God Loves Daddy and Me will remind parents and little ones of how much they are loved. God Loves Daddy & Me and it’s companion book God Loves Mommy & Me just bring a smile to my face. God Loves Daddy & Me points out positive attributes of a God-honoring father loving his child as THE Father loves them both. Laura Watkins’ illustrations bring such light and just sheer adorableness to the story. The raccoon daddy and child are so cute! You’ll love that the child is not stated as being male or female so daddy and son or daddy and daughter work equally well. I wholeheartedly recommend both God Loves Daddy & Me and God Loves Mommy and Me for you and your child. Snuggle up and celebrate the relationship that you as a mom or a dad have with your Heavenly Father and your little one. Laura Watkins spent her childhood drawing on huge rolls of wallpaper (and sometimes, if she ran out of paper, the walls themselves). As a grown-up, she’s thrilled to make her living drawing and painting, with two Irish setters, two cats, and a white freckled horse providing constant inspiration. Laura is an internationally published illustrator of Children’s books and is in print in 14 languages. Laura has worked on a variety of briefs, from pop up unicorns to Korean picture books. Laura is always busy working on new and exciting projects.